What happens if you - due to the economic crisis – can’t pay your rent or mortgage anymore? The bank or your landlord will evict you. Some people in Spain are fed up of missing solutions by the authorities, which rescued banks but not the people. Their solution: squat empty buildings owned by the banks. Lorena Meca used to live with her husband and two daughters in her own apartment, bought with a mortgage in Puerto de Mazarron, a tourist village on the Spanish coast. She worked as a waitress and her husband was employed in the prosperous building industry. With the two salaries they had no difficulties making ends meet. But seven years ago both of them lost their jobs, just like many other people in the country during Spain's economic crisis. The Meca family couldn’t pay the mortgage any more. 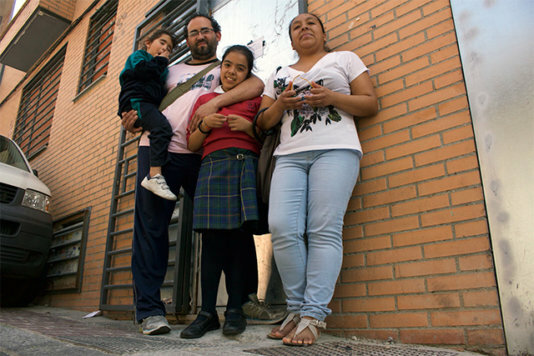 The bank took their home and they moved to Madrid, searching for better work opportunities. But the situation didn’t get better for them. One day they are told about a citizen network by some other people suffering in the crisis and the austerity policies. The platform for People Affected by the Mortgages (PAH) has a branch in Vallecas and organizes groups to squat empty buildings. At first the Mecas are reluctant. They fear being called squatters, but they are on the edge. Their landlord is increasing the pressure – cutting off electricity and water supplies, sending people to intimidate the Mecas – only to make them move out. Just when the PAH had an 11-apartment unfinished building the Mecas finally joined the platform. The construction company who had owned that building went bankrupt and the financing bank became the owner. The Meca family lived in that apartment building for almost a year without windows, with a low voltage power connection and no water supply. “We got a power connection, but if we turn on one light, we had to turn off the others. When the neighbour turned on the microwave oven, we had to unplug our electrical appliances,” Lorena remembers. “With no windows nor water, my younger daughter got an eye infection. It ulcerated,” she adds. It wasn’t easy for their older daughter, either. “In school she didn’t want to say where she lives. She was embarrassed. She’s still undergoing psychological treatment,” Lorena explains. Spain sees an increasing number of people who are not able to pay their rent, let alone a mortgage. “Spain leads the European ranking of empty apartments, with 3.5 million,” says Carlos Macías, spokesman of PAH. “The stock of social rental housing is less than 1% of the total existing housing stock”. From the late 1990s to 2008 the Spanish property market boomed and many people bought apartments as an investment at exorbitant prices with mortgages of up to 30 or 40 years. But a big number of them couldn’t be rented and stood empty. This enormous real estate bubble was one of the reasons for the following economic crisis. The situation became worse. The deceiving prosperity vanished, many lost their jobs and were not able to pay their mortgages. Many families were evicted. According to the Spanish law, people have been forced to pass their houses to the financing banks but are still owing them the loan. Since 2007 there have been more than 370,000 evictions and almost 200,000 are still in process. In addition, many empty apartments raise the rental prices. As Spain has an unemployment rate of over 23 percent, many people cannot afford to rent anymore. Most Spaniards disallow the management of the crisis by governmental authorities and criticize the behaviour of the banks, especially as many of them have been rescued with public funding. 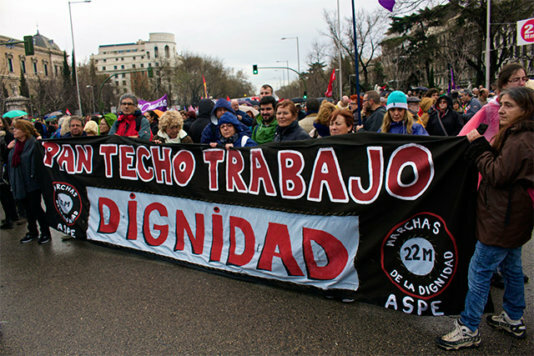 As a result, social engagement and protests are increasing within the Spanish society and citizens associations are flourishing. PAH is one of them. Founded in 2009 by people left desperate by the loss of their homes, its members help each other and share information about the administrative tools they can make use of. They are now an important group for social and political pressure to stop evictions, and they have more than 200 branches across the country. The images of their members demonstrating in front of residential buildings against the evictions of families have became the symbol of a population fed up with the management of the crisis by the government and the taking advantage by the banks with no consequences but for the citizens. PAH’s success and popular support encouraged them to go further and lobby for policies against real state speculation in order to fit the rental prices to the reality of the people’s economy, to enforce tenants to put empty houses on rent and to increase the stock of social rental housing. The goal, she points out, isn’t to live in there without paying. They inform the banks, negotiate with them and try to get socially compatible rents with the help of political authorities. PAH doesn’t consider this practice as squatting; they call it “recuperations”. “Our society has invested millions of euros in the banking system and they haven’t given anything back. We are all paying the bad management of banks. These apartments are the property of the people”, says Macías. “We only take a building when we consider it as legitimate that citizens get it back. That means, the building has to be owned by a bank. We immediately start the negotiations with the owner,” Lotta confirms. Lotta, a sociologist, also lives in one of these “recuperated” houses. Before that, she had to pay 250 Euros for a room in a shared apartment with four other roommates. This rent took half of her earnings from a research grant and when the grant expired, she didn’t find a regular job. 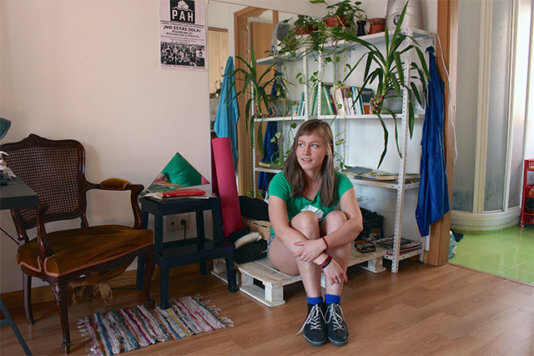 Now she is a freelancer with an average income of 300 euros a month - not enough for a rented apartment in Madrid. Lorena Meca’s family was luckier. The bank who owns the building they “recuperated” agreed to negotiate. In the end other empty, more suitable apartments for the eleven families were provided out of the bank’s property portfolio. 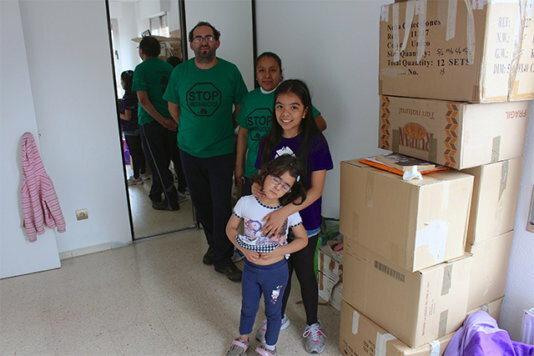 Now Lorena’s family lives in a three-rooms flat. They pay 50 euros per month plus utilities. “The price is fixed individually accordingly to the documented incomes of every family. We ask that it can not be over 30 per cent of the overall incomes,” Lotta says. Lorena Meca’s family in front of the squat building they were living in. Now it has been sealed by the bank. Lotta in front of the building of her “recuperated” apartment. The signboard of the PAH has the slogan “Yes, we can”. Lotta in her “recuperated” apartment. Lorena’s family in their new apartment.